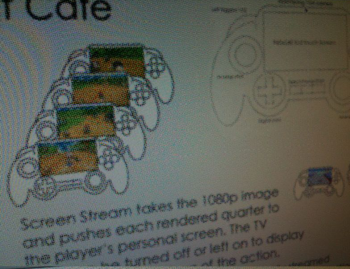 Project Cafe's fancy controller sounds more similar to the 3DS by the day, and an anonymous source says this might not be a coincidence. According to a source that Develop calls "close to the matter," the controller for Nintendo's next console will have a front-facing camera, which will be used for creating in-game images. This comes after weeks of speculation about the new console and its controller, and the source also claims to be able to confirm some of those rumors. Supposedly, the controller will indeed have a large, 6 inch touchscreen (stylus perhaps included) and a standard button layout, as was first rumored about a month ago. With a touchscreen and camera, the new controller sounds suspiciously like a Nintendo DS or 3DS, and the source believes (but does not know for sure) that the handheld may be able to be used as a controller for the console. "The functions are the same," he says. "It is a standard wireless controller added with a front-facing camera and touch screen. That sounds far too much like a 3DS to me. But I can't confirm this, Nintendo is being very cautious about the details." While it would certainly be interesting to see Nintendo's handhelds integrated into its next console as controllers, we won't know for sure the design or capabilities of either the console or its peripherals until Nintendo makes its official reveal next month at E3.